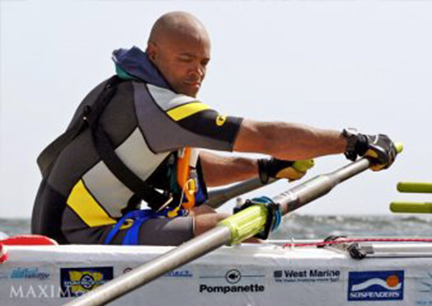 NEW YORK – An American rower who set out to cross the Atlantic Ocean in honor of his brother reached the Caribbean island of Saint Martin. A spokeswoman for 48-year-old Victor Mooney said early Saturday the specially built oceangoing rowboat was towed about 20 miles to shore Friday while Mooney was aboard a search and rescue vessel. He has lost 80 pounds as he continues a 3,000-mile journey from the African coast to the British Virgin Islands, and then another 1,800-plus miles to New York. Mooney set off Feb. 19 in a 24-foot boat from Maspolamas, Gran Canaria. His journey is being done in honor of a brother who died of AIDS in 1983. Mooney is hoping to encourage voluntary HIV testing. Mooney has tried the same feat three other times, without success. Mooney’s first trans-Atlantic attempt, in 2006, ended when a 24-foot, wooden rowboat he’d built himself sank off the West African coast just hours after he’d pushed off from a beach in Senegal. Three years later, he tried again with an oceangoing rowboat boat built by a professional. Its drinking water systems failed after two weeks at sea and he had to be rescued. In 2011, Mooney set off from the Cape Verde Islands in an even more sophisticated boat. But that vessel, dubbed the Never Give Up, had apparently been damaged in transit and sprang a leak shortly after he put to sea. He escaped in a life raft then spent two weeks drifting 250 miles on the open ocean. 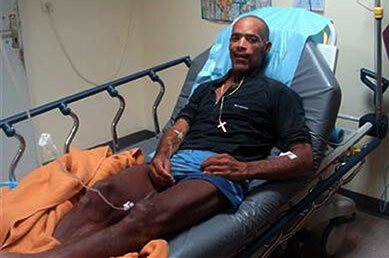 SAN JUAN, Puerto Rico (AP) – Three times, Victor Mooney tried to row across the Atlantic. Three times he failed. One boat sank. 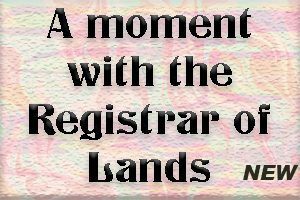 Another lost its freshwater system. A third sprang a leak and left him drifting on a life raft for two weeks. As he planned for a fourth attempt, his wife made it clear it would be the last. “I’m going to give you all the support you need, but this is it. We have to close the book on this one,'” Mooney recalled her telling him. Now the 48-year-old Brooklyn native has finally completed the roughly 3,000-mile (4,800 kilometer) journey. Mooney was recovering Saturday in the Dutch Caribbean island of St. Maarten, a day after reaching shore and ending a 128-day ordeal during which he lost 80 pounds (36 kilograms). The trip was fueled by his desire to bring attention to the need for HIV testing and to honor a brother who died of AIDS in 1983. On Feb. 19, Mooney left the Canary Islands off the coast of Africa in high spirits. But those faded as big waves and violent currents began to toss his 24-foot (7-meter) boat around, alarming nearby boaters who radioed him. “It was a tanker who said, ‘Do you know where you’re at? Are you OK? Are you in your right mind? '” Mooney recalled. He paused, and the devout Roman Catholic, who had placed crucifixes all over his boat, reminded himself to be still. The weather began to improve, and Mooney also received help from an oceanographer and meteorologist, among those he chatted with by radio while crossing the ocean, saying he never felt alone. The African-American recalled that his journey took the path of the trans-Atlantic slave trade. “I asked my ancestors also for help to push me along,” he said. Mooney settled into a routine, awaking at 4 a.m., then rowing for about an hour at a time and taking 30-minute breaks until 7 p.m. But the ocean remained rough for most of the journey, often erasing his progress. He would devour several portions of freeze-dried food in one sitting and eventually ran out. He resorted to fishing until his tackle line broke, so he began to scoop fish up with nets or rely on flying fish jumping into his boat. Then a shark attacked his boat and punctured it. He felt the hit and scrambled to repair the damage while the shark chased fish milling underneath the barnacles attached to his boat. He reminded himself to be still again and prayed, thinking about his wife and other supporters. “Sometimes just putting on deodorant, smelling that fresh deodorant was encouraging, inspirational,” he said. As he neared the Dutch Caribbean island of St. Maarten, he had a final conversation with a nearby tanker. Medical officials have not yet allowed Mooney to eat that burger, feeding him instead small portions of oatmeal and light sandwiches as he recovers. “I haven’t weighed 140 pounds (64 kilograms) since 6th, 7th grade,” he said with a laugh. In St. Maarten, he plans to eat well and replenish his energy with help from doctors and supporters, including a government team from Anguilla – his intended destination – who visited him on Saturday. Once he gains back his strength, Mooney plans to row to the British Virgin Islands and then another 1,800-plus miles (2,900-plus kilometers) to New York and eventually home to Queens, where he runs a nonprofit South Africa arts organization. It’s a journey he said he never plans to do again, but he urged people to get tested for HIV and to keep fighting to find a cure for AIDS. He recalled an audience that supporters arranged for him with Pope John Paul II in the early 2000s. “When John Paul gave me his blessings on World Aids Day and said, ‘Row,’ that always stayed in my mind,’ he said.